Pulped-Free is a cyber-noir space pirate adventure set in the early 26th century. It loosely explores some disability rights themes in between the pulpy cybertech, sentient space ships, and smuggling. Many thanks to D’Arcy Wolfsburg for additional graphics and tech design, and to my patient and flexible writing group who tolerated the addition of images to our regular critique routine. 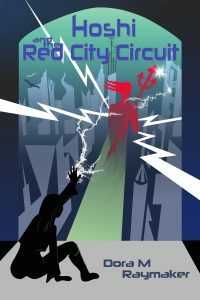 Hoshi and the Red City Circuit - Due to their unique neurology, only the enslaved Operator caste can program the quantum computers that run 26th century Red City. When three of the caste are ritually murdered, it’s up to private investigator Hoshi Archer—herself a recently liberated Operator—to help the police solve the case. Things get complicated when one of the victims turns out to be Hoshi’s ex-girlfriend, power-hungry bureaucrats and old rivals stir up new problems, and an immortal, amoral alien may even be involved. To unwind the plot to take over the city, Hoshi must decipher a deadly computer program and learn to communicate with the alien, before it’s too late for the next victim—and the city. Spoon Knife 3: Incursions, a neuroqueer anthology, includes my short story "Heat Producing Entities" featuring Dragon (with appearances by Djen and Muse) . You can find more information about me and my "other life" as a scientist at doraraymaker.com.